Paul teaching English to the 11th grade class. Tomorrow will mark the second month here in La Esperanza and Maestro en Casa, minus the brief time back in the States. We know that because tomorrow our monthly rent of a whopping $150.00 is due. I defy anyone to find a two bedroom house in the States for that kind of money. If you don’t want to spend any money, come to Honduras. Unfortunately, if you don’t want to make much money, namely none, come to Honduras. In any case, after two months we are both beginning to feel we are settling in. It’s taken more time than we anticipated to find our fit. That was not the case at all where we had been. At Montaña de Luz there was always a lot to do. Things needed to be responded to on a daily basis. But, here that is not so much the case. The program runs fine, albeit on a shoestring of a budget, and would run fine with or without us. Our task here, therefore, has been much more open, subtle, and creative. It falls to us to discern how we might present ourselves in such a way as to help the program to become that much more efficient and sustainable, and become a little more impactful on the students who utilize it. The teachers teach, and they do a very good job of it given the limitations, mostly financial, of the program itself, and the challenges of an extremely sub-par education system in Honduras. The program is administered well. There have been quite a few short-term volunteers who have come and gone. They would mostly teach English, or involve themselves with construction projects, or other short-term endeavors. There haven’t been many long-term volunteers at all. I suppose the founder, Susan, could have been considered a long-term volunteer as I suspect she never took much of a salary, if any, from Maestro de Casa. Presently, she is semi-retired, and living in Vermont. So, when we first arrived, I think the staff at Maestro en Casa had to wonder what to do with these crazy people for the next year plus. But we were welcomed by people of great commitment, and through a series of fits and starts, we have begun to figure out how we can be of assistance. Paul having fun with the class. We walk in and back to Maestro en Casa six days a week. Monday is our only day off. Tuesdays and Wednesdays are mostly office days as there are no classes scheduled at the facility. 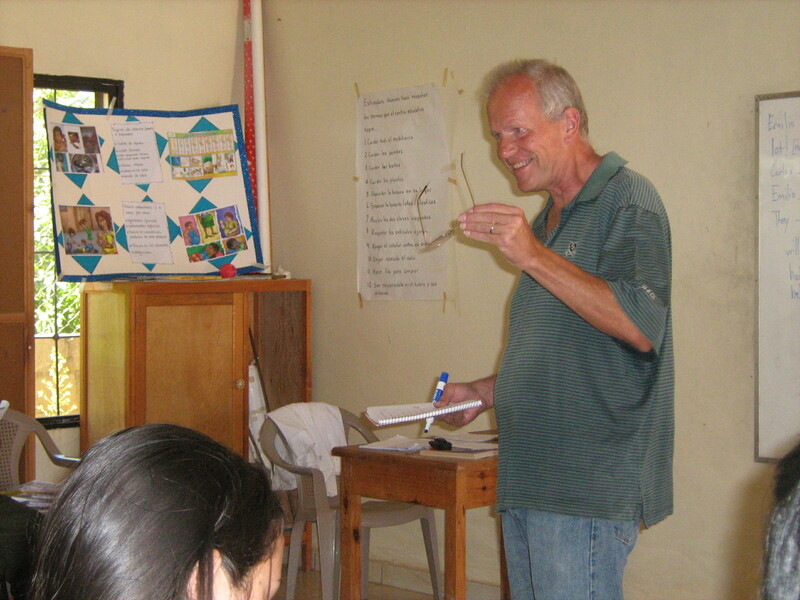 Some of the teachers are off-site teaching classes at some of the smaller villages. These days we are often correcting papers, recording grades, and managing some of the endless bureaucratic demands of the Honduran government. What they lack in quality education, they make up for in administrative nonsense. Laura has been searching out and applying for foundational grants. Thursday through Saturday are class days at the center. On Thursday, we teach English to about 25 Bachillerato I students (10th grade). 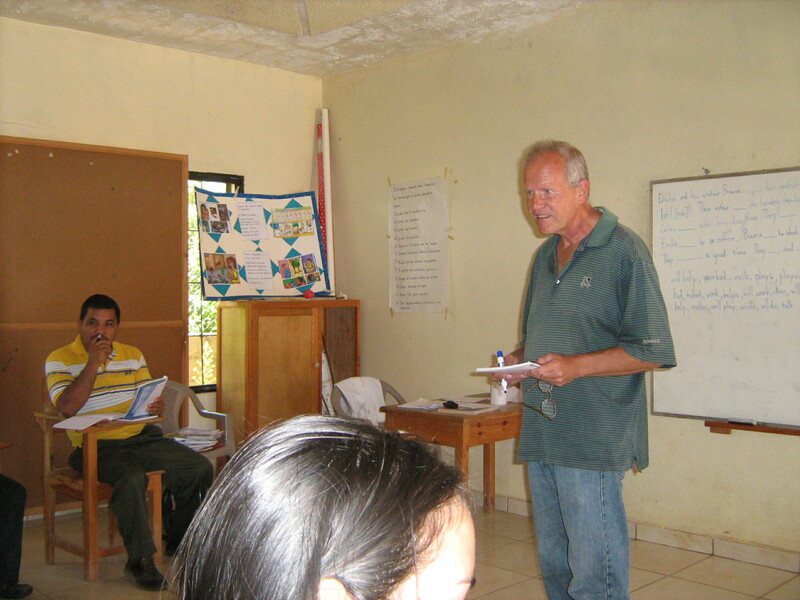 On Friday, we teach English again to fifteen Bachillerato II students (11th grade) who will graduate in November. In a few weeks we will begin a Socio-Economics course with these same kids. I have come to a new appreciation for teachers. Preparing for the classes (Laura’s talent – not mine) and then actually attempting to get kids to learn something has to be one of the most difficult jobs in the world. Somehow though, we have a great deal of fun doing it. Laura and I team teach. It has been joyous and I think the kids get a lot out of watching us interacting. Saturday is a more relaxing day as we, ourselves don’t have a class. We usually have opportunity to involve ourselves with the kids, either formally by way of proctoring a test or filling in, or informally. Sunday is not officially a class day, but one of the teachers runs a computer course. Laura is very much partnering with the teacher on this, and today took the class to teach Excel. The work day ends at around noon on Sunday, giving me time to write this blog. We are very busy, and we are carving out our little space. Still, if you haven’t noticed, very little of what I described in the last paragraph could rightly be called social work. So why are we here again? And why am I saying that it feels as if we’re beginning to find our fit? One word answer, really. Relationships. The longer we are here, the longer we present ourselves as non-threatening, and the longer we seem as if maybe we might have something to offer, the more willing people are to build relationships. It is said over and over again in Social Work classes that the foundation for any meaningful change is trust and rapport. Still, we often skip this step. We rely on programs and paradigms, systems and analyses, and we avoid the hard step. Here, we don’t have a lot of those professional, social work supports. You can’t skip the first step, and it makes all the difference. It is only now, after two months, our bright faces showing up day after day, that a few of the teachers are finding confianza (trust): starting to share with us their personal stories, their dreams and fears, personally and for the program. That is really what is making us fit in. Remember doing this? Conjugating verbs. We met three Americans this week, all three in the same way. They have cars and drive in and out of the main town. We walk in and out of the town every day. After they had seen us maybe a dozen times, they stopped and asked if we wanted a lift. The first is a gentleman who runs medical brigades in conjunction with the local hospital. He also runs a shelter at the hospital for pregnant women from the outlying towns so they can receive medical care and be close to the hospital around delivery time. We met him when he was returning from San Pedro Sula after dropping his wife off at the airport for a trip to the US. The second man was with his wife. He is the vice-principal of a private, bi-lingual school that teaches according to the American educational model (therefore they are now on “summer” break). These persons, I’m sure, will be vital contacts, and perhaps even vital supports and friends, for Laura and I. The point, however, we would have never met them if we had not simply been present. It is extremely important. What do we hope to do as we build these relationships at Maestro en Casa? We lose a lot of kids over five years of study. The great majority of them come in with great hopes to receive their high school diploma and perhaps go on to college. This is a dream that is mostly achievable in developed countries. Over a hundred students enter our program in the seventh grade. But, somewhere between fifteen and twenty-five actually leave our program with a high school degree. Some of them perhaps go on to a different program. But the great majority simply return home. There is a great deal of challenges and frustrations. Sometimes that frustration can turn to anger, alcohol, and drugs. As we meet these kids and get to know them, we might be able to help them sustain their hope and meet their challenges. I hope so, anyway. One thing I’m sure of. If we aren’t here, and we’re not known, it won’t happen.